The only personality test to show you how to grow your confidence, increase your value and live more authentically. 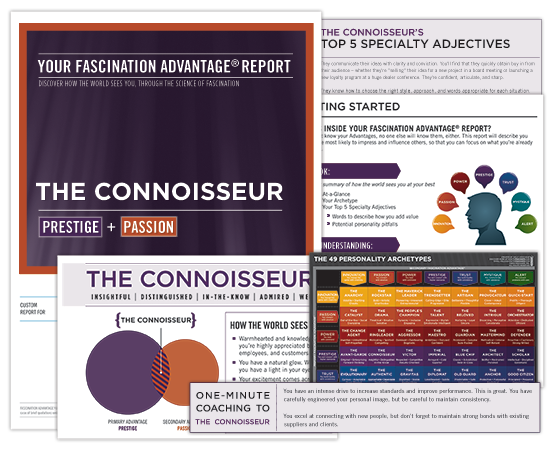 The Fascinate® Personality Test is the first way to measure your personal brand's most impressive qualities. By enabling us to identify each team member’s highest value during the hiring process, the Fascination Advantage assessment has helped us to assign team members to the right role based on their personality. This approach has helped us boost sales by 50% and almost doubled our retention rate. The Fascinate® Personality Test is based on a commissioned study by Kelton Global. It measured how people interact with brands, and the different communication styles humans respond to. We found seven different advantages: Innovation, Passion, Power, Prestige, Trust, Mystique and Alert.